The mad-men are gone. But Advertising is still the Daddy. I’ve been invited to participate in a panel discussion at the Financial Services Forum next week: 5 speakers, each defending a different piece of the “integrated marketing mix”. The premise is that we’ll all argue about which marketing “discipline” deserves the biggest share of your marketing budget and have a right old ding-dong. I bet you can hardly wait? Someone’s doing PR, someone else is doing Digital & Direct, someone’s doing Sponsorship etc. I’ve got poor old, dusty old Advertising. Of course, I’ll be arguing that all the disciplines in the marketing mix are important. Of course, I’ll agree that all disciplines always work better when they work together. But I’ll also argue that a strong central idea, compellingly expressed to enough people for an apparent consensus to form is still THE prerequisite of any successful integrated marketing communications intervention. And for this, Advertising remains the Daddy. It’s still the best place to set out your stall because the content remains under your control, unlike many of the other elements of the marketing mix. And rumours of its demise have been greatly exaggerated, with a compound annual growth rate in global spending on advertising of almost 5% predicted between 2011-2016. The European picture over the next three years shows all advertising media growing except Newspapers and Magazines (down 7% and 8% respectively). 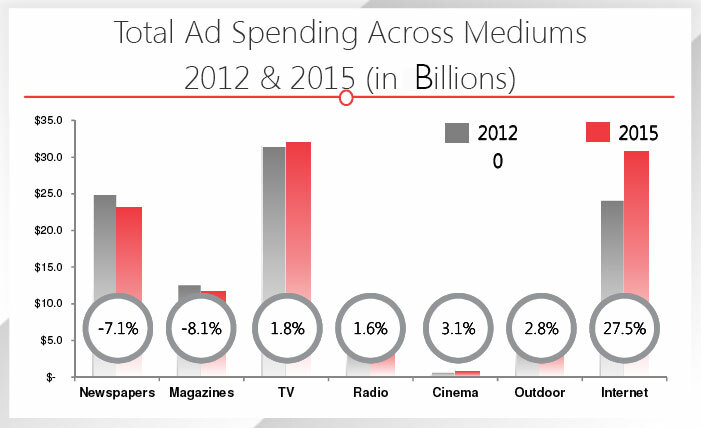 TV advertising remains the largest single medium and is predicted to grow at just under 2%. 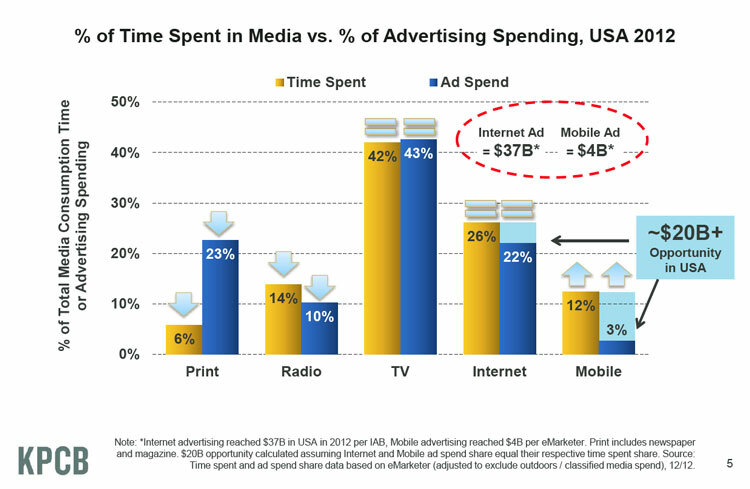 And, of course, spend on digital advertising, fuelled by mobile, is racing away, with almost 30% growth. It’ll be almost as big as TV by 2015. Tracking advertising revenue vs. the time people spend watching/using, gives a useful way of predicting where the growth/decline in ad spend is likely to be. The figures below are from the US, but the European picture is extremely similar. It shows a rapid decline in the amount of print media being consumed and a corresponding rise in Internet and Mobile usage. 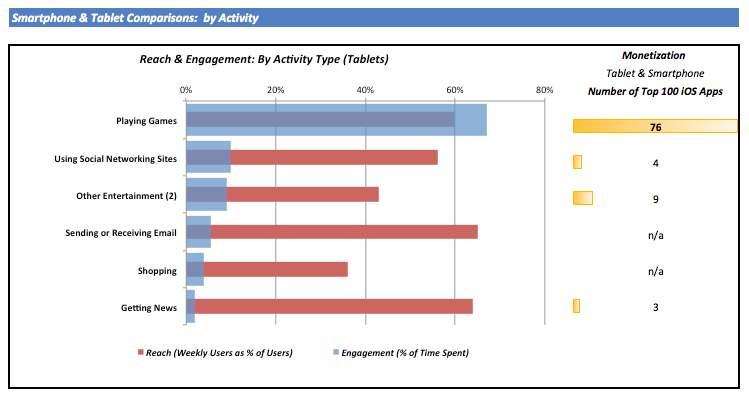 But, if you look at the data, this merely reflects a switch in the way print media is ‘consumed’ as people begin to read publications through tablets and mobile apps. It’s very far from a death knell on print advertising. 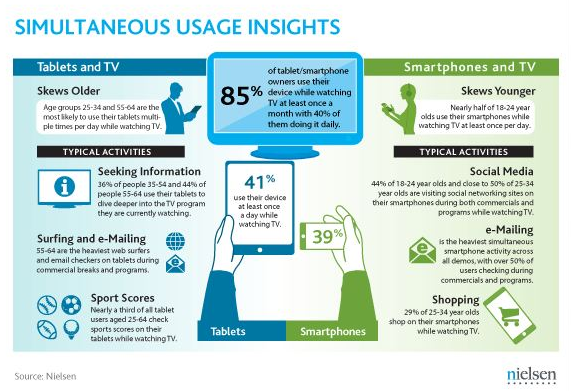 TV viewing and ad revenue remain firm (and huge). The figures also disguises, in my view, a significant increase in the influence of Advertising, because of the rise in video sharing on the internet and, increasingly, through mobile. The convergence of technology now allows static ads to move, broadcast techniques to be targeted and two-way communication to become a part of previously one-way channels. An increase in effectiveness Vs. other disciplines is surely not TOO much to expect? Internet soothsayers predict that audio will be the next sharing revolution. So, if you have any sense, now’s a good time to get your creatives to remind themselves how effective radio advertising is constructed. Before we leave this, there’s one other area of significant advertising growth that usually gets left out of most pieces of analysis. 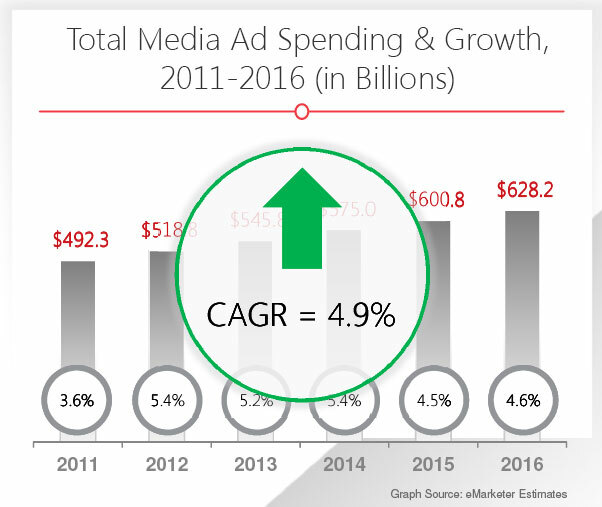 Ad spend within the gaming market will have grown by a factor of 10x between 2010-2015 ($87M to $894M). And again, this media usage and consumption of advertising appears for the moment to be largely additive, not substitutive. I hope that this barrage of data from different respected sources has done something to persuade you that advertising has a brighter future than many would have you believe. But I’m not expecting my City-based audience to equate commercial success and growth potential with effectiveness – despite them using this very same argument when hawking their own wares. Its proven effectiveness in generating consideration and trust through sheer familiarity. This is not a speculative hypothesis. It is a fact. A brand that is well-known, that is apparently dynamic and that seems to be ‘up to stuff’ is always a comforting choice. That’s why even bad ads work quite well. Pic of coiffed, preppy millionaire with equally repellant mini-me son-and-heir, with the line, “You never really own a Patek Philippe. You merely look after it for the next generation”. Even whilst making you want to spew, it has worked its magic on you. You don’t see the ad and think, “ooh, that’s an excellent reason to buy an obscenely expensive watch. Watches of Switzerland, here I come”. But you have clocked (sorry!) that PP makes gorgeous, crafted timepieces (they do, in fact!) that appear to be desired by super rich over-achievers, world-wide. And your brain has probably subconsciously salted away the “I’m not buying it for me” excuse that said over-achiever can use for treating him or herself. Most importantly, because you’ve probably seen the ads quite a bit – as I have, you have had the idea of PP as a desirable status symbol ‘normalised’ because you recognise that others will have seen the same thing and reacted in more or less the same way. If Patek weren’t successful at selling beautiful watches to rich people they wouldn’t be able to afford their premium position advertising, after all. Only a fool would invest in advertising that didn’t work, right? And that’s the way lots of ads work… Car ads, ads for investment funds, and ads for hundreds of other things that are essentially just the same as each other. (Try and explain to me, if you can, the real qualitative difference between a Patek Philippe, an IWC and an Omega). Advertising sells branded analgesics like Nurofen, that are (by law) chemically identical in formulation to own brand versions but retail for three times the price. Customers prefer the branded versions and will swear they are more effective. Even though they can’t possibly be. 2) Hone your customer proposition and service delivery to the point where your customers will always publicly evangelise about you in the digital ether, and never complain. 3) Develop a CRM programme so sophisticated that you hit the precisely the right people at precisely the right time with precisely the offers they want. Everyone who comes in through our door wants a “viral” these days. I explain as patiently as I can that “full-service” doesn’t include that sort of thing anymore and we’ve all had our jabs in any case. They then look a bit confused until I put them out of their misery. “That’s it!” they say, brightening visibly. I guess it’s just a function of our preoccupation with celebrity and the parallel attraction of something for nothing. But there’s usually a problem. Scan the list of most shared videos online and count how many have commercial/branded origins? Now take that list and count how many have succeeded in a way that is consistent with their brand idea and character and doesn’t contain a moonwalking Shetland pony. There are some, but we’re entering Lotto-style percentage territory. What you can’t check is the same picture looked at the other way round. How many truly appalling, cringe-worthy attempts have been made to leap this particular existential chasm, and how many mangled examples of ill-conceived, out of character nonsense now languish at the bottom of the trench, their abject failure indelibly tattooed on them for all to see: “143 views”. More extraordinary still are those organisations that seem to think that they can swap their successful strategy of carefully deploying professionally crafted integrated marketing communications assets for an approach where you essentially stick everything on red and hope you hit the jackpot. My point goes further, though, than showing how slim your chances of digital glory are. Because even when it works, it doesn’t do you as much good as you might imagine. Successful brand marketing is about achieving everyday familiarity not about getting famous. Branded products are trusted over non-branded products. This is a fact. Branded products are more considered by potential customers than non-branded products. They also command higher price points and (usually) margins too. These things are also facts. Marketing people, who seek constantly to impose rational order on the behavioural chaos that surrounds them, will usually argue that it’s because they have come to stand for something on which the customer can rely. This is true. But it’s not as true as they imagine. Research we conducted into a very undifferentiated, apparently price-driven market threw up some rather astonishing results. Before I explain these results I need to emphasise a crucial difference between two commonly used marketing research measures: spontaneous brand awareness and prompted brand awareness. 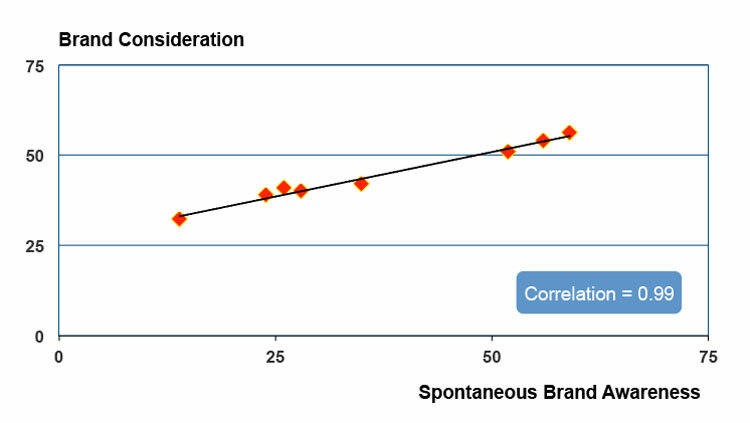 We discovered that brand consideration was almost perfectly correlated with spontaneous brand awareness. The correlation between brand trust and spontaneous brand awareness was also extremely high, in excess of 0.8. We were a bit shocked. But we shouldn’t have been. Actually the recent research into behavioural science confirms the power of familiarity. It seems our brains are hard wired to prefer the things they recognise and to fear unfamiliar things, people and concepts. If you want a really shocking demonstration of how these effects influence all our judgements and prejudices, visit yourmorals.org and take a few of their online tests. When you get into the science itself, it’s all part of the way in which our brain conserves energy, using data from previous experiences rather than recalculating anew each time. We make choices that have worked for us in the past. When we have no experience, we search for instances of other people (as like us as possible) having positive experiences and we use that as a proxy. “500 million Elvis fans can’t be wrong”, we say to ourselves and the job is done. Another effect (called the “availability heuristic” in Behavioural Economic Science) means that we also tend to overestimate the prevalence of things we are familiar with and/or have experienced recently. “Is this phenomenon widespread?” we ask ourselves. Off scurries the brain, searching for examples. If it can find two or three examples easily, it concludes the phenomenon is indeed widespread. If no examples come to mind, it concludes the opposite. There is practically no correlation between prompted brand awareness and either brand consideration or brand trust. So being famous (‘have you heard of) doesn’t get you trusted or considered. But being familiar (‘which brands can you think of now’) does. I’ve used data from an undifferentiated market (where products are considered quite similar to each other) because that’s where this effect is most marked. The more differentiated your product is within your particular category, the less important everyday familiarity will be, relative to other brand dimensions. But don’t underestimate its power, even in these instances. Until you are talking about real fashion brands and high-end luxury purchases, familiarity remains the single strongest driver of both consideration and trust. Despite this, an amazing number of marketing people insist on using prompted brand awareness as their key measure of success even though they can link it to no commercial effect. 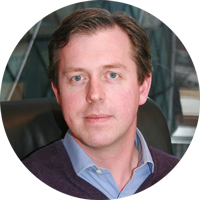 Years ago I ran the global advertising account for a huge multinational company. It was my first experience of ‘stakeholder engagement’ on a global and massive scale. The company prided itself on being a ‘consensus culture’. So two dozen plus people had to sign-off on the global corporate ad campaign. Since these were senior executives who thought their daily dollar unearned unless they had ‘added value’ to the things on which they were consulted, this was something of a challenge. But I found a neat way round the problem. It turned out that these senior people had one concern greater than the need to add their own twopenny-worth to the process. They were extremely concerned to know how their peers were voting. Having read “The Righteous Mind” by the wonderful Jonathan Haidt, I know why this is. Actually we rely more than we would care to admit on the opinions of others, rather than our own judgement. We use our peer group – the people whose approval enhances our status and self-image and whose censure has the opposite effect – as a sounding board for our own sentiments. More often than not we’ll change our mind to ensure our views fit the consensus, whilst all the time persuading ourselves that we are masters of our own mind and others merely agree with our common-sense view of our surroundings. Which made my task considerably easier. “Nigel, I’d love your view on these new commercials we’re proposing”, I’d begin, “I showed them to Colin in Kuala Lumpur last week and he said they were a breakthrough for a company like ours”. “Yes, It’s about time we stood up for what we believe”, Nigel would agree. “Nigel says it’s time we stood up for what we believe”, I said. “Simon says using your people in the commercial lends it great credibility”, I’d tell the next guy. Eventually, I would actually go and see Colin in Kuala Lumpur, with everyone’s feedback in my bag (and with a bit of a lump in my throat). “This kind of thing is a breakthrough for a company like ours”. I know you’ll think me underhand and deceptive. But these individuals – 90% of whom knew next to nothing about creating commercials – were genuinely delighted with the decisions they had taken. And because skilful and talented creative people had crafted the ads in good faith to a brief written by a planner who cared about the company’s commercial success, everything ended extremely happily ever after. Dear client, no one is really reading your ads. There. I’ve said it. Sorry. And, I admit I’m exaggerating a little. The copywriter who wrote it has read it, obviously. And our proofreader has checked it for spelling mistakes. A few of your sales guys and gals have read it (and have pointed out that they would have written it rather differently). So don’t put anything you need people to remember in it, please. Ads don’t work that way. They are absorbed, not read. The copy is there to reassure the viewer (yes, they’re viewers NOT readers) that – were they to feel inclined to read it (which they’re not) – they would find there all the information they need to rationally justify the proposition in the headline that they’ve already absorbed. Even if it’s a real corker, the headline and concept will usually only sink in gradually, over repeat viewings. Your proposition will be trusted by a factor of how familiar it is to your audience and how trusted your brand is already. Without these two criteria, your proposition can never save you. I hope you can nod along to what I’m telling you armed only with your personal experience of interacting with prints ads yourself. If not, we have plenty of data to prove it to you. So do us all a favour. Try to encourage your people (as we do) to spend slightly more time creating well-branded ideas that really stand out, and slightly less time jamming twenty-seven proof points into the larger and larger copy section.